Why Am I Not Tracking Any Sales In The Dashboard? Clerk.io needs to continuously track sales from the webshop to keep results up-to-date with your customers' behaviour. However, some settings in a webshop may cause the sales-tracking to fail. Below, you can find out how to debug the sales-tracking and see what the most common issues and solutions are. 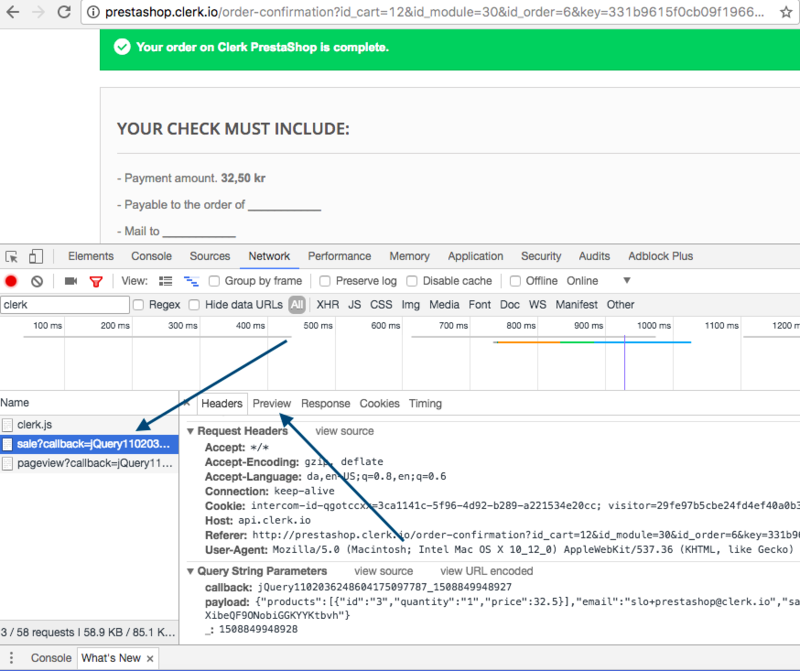 The Sales-tracking script on your Order Success page. These are required to track sales in general. The easiest way to identify a sales-tracking issue is to place a test-order. The below guide will use Chrome as an example, but other browsers have similar features. Start by putting a couple of products in the basket. Before placing the order, open your browsers Console. Find Network, and narrow down results for "clerk". Place the order, so you see the order confirmation page. Click the sale?callback=... call to see the details that are being sent to and received by the sales-tracking. By clicking Preview you can easily identify any errors that will cause sales to not be tracked. Error 1: "Invalid Syntax In Argument: products"
This error happens if the product IDs you send have a wrong syntax. The list of product IDs contain text-formatting characters like this: "products":[\"id"\:\"123-m"\]. The format should be pure JSON, to eliminate any formatting. Error 2: "Missing Argument X"
This means that you are not sending all the data Clerk.io needs to track the sale. Make sure you include all the data- attributes in the sales-tracking. Usually, if Clerk.js has not been loaded, it's due to Require.js blocking the Clerk object. To fix this, you need to include Clerk in Require.js. Try each of these approaches and place a new test-order to see if sales are now being tracked.